Oh, man. That is gorgeous. 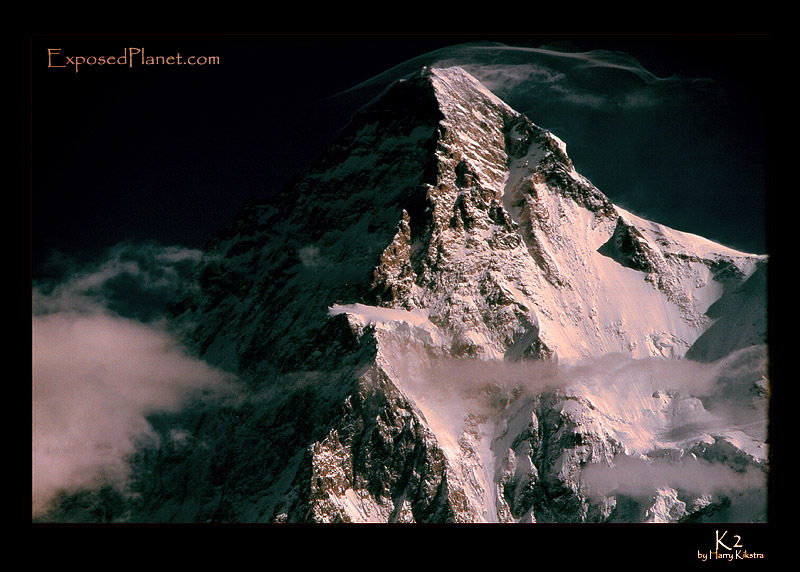 I usually whisper a \'nice\' or even \'beautiful\' on opening Harry\'s picture present in the morning, but this K2 picture provoked a loud \'WAUW!\'. I love the mysterious and dangerous dark side, the bright pinkish snow against the black sky and the contrast between the heavy rock and the light cloud on top. There is something both visually attractive and physically dangerous in this shot. Une photo de montagne vraiment parfaite selon moi. As-tu utilisé un filtre de type ND4 ou autre ? En tout état de cause, une très grande photo , félicitations ! The story behind "K2, Pakistan"
Taken a bit later than my previous posted image of K2, the 2nd highest mountain in the world at 8611m altitude, in the Karakoram mountains of Pakistan. Shot with Eos 5 and 70-200mm on provia slide, scanned later. Taken a bit later than my previous posted image of K2, the 2nd highest mountain in the world at 8611m altitude, in the Karakoram mountains of Pakistan.Shot with Eos 5 and 70-200mm on provia slide, scanned later.